Website: Darklands Fashion Store Berlin _ Mathias Vestergaard Corp. 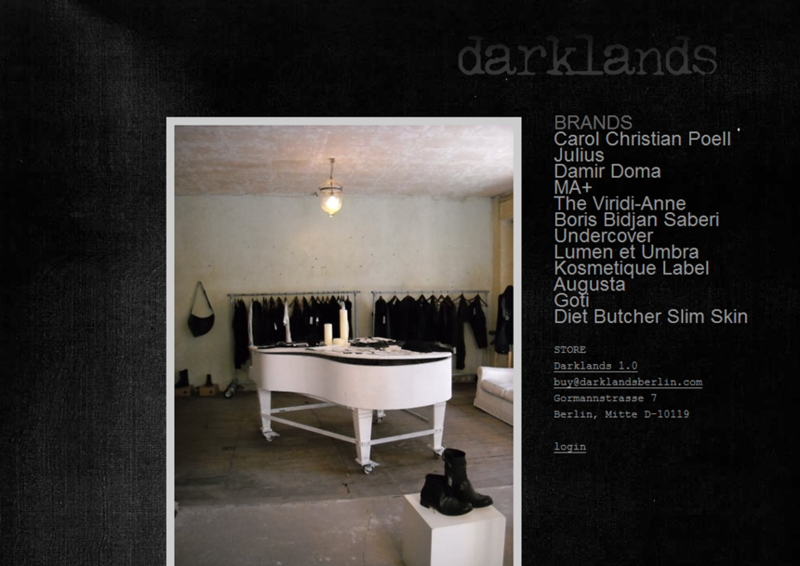 In addition to being an album by Jesus And The Mary Chain, Darklands is also a brand new fashion store in Berlin, Germany. It features some of the most exclusive high-end men’s fashion brands, including Carol Christian Poell, Julius, Damir Doma, MA+, The Viridi-anne, Boris Bidjan Saberi, Undercover, Lumen et Umbra, Kosmetique Label, Augusta, Goti and Diet Butcher Slim Skin. The website is build on WordPress, with a simple custom theme based on the mono-space logo-type and huge, functional fonts. The only visual effect is the subtle fabric-like background, adding a material/industrial feel to the website. In addition to, a showcase of the physical store, the website also displays an online catalogue. If you find something you like, just write them an e-mail and they will help you find your right size and ship it right off to your doorstep. This entry was filed under Fashion, Websites.